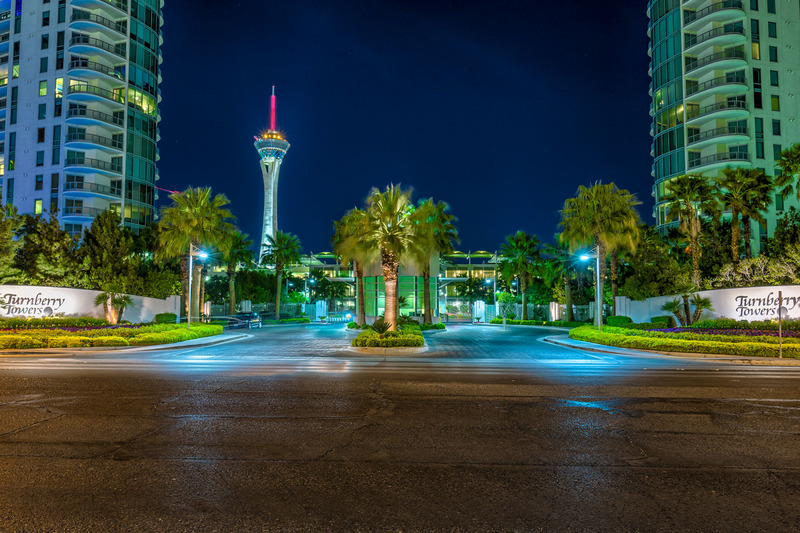 Contact The Stark Team to get started in your Las Vegas Penthouse and Condo search in Turnberry Towers Guard Gated buildings. If you are interested in Turnberry Towers Condos, you may want to browse condos for sale in the very luxurious guard gated Turnberry Place, its sister property across Paradise Road. Both Turnberry Las Vegas communities are a quick ride to McCarran International Airport. Ten Minutes Max. And Paradise Road runs parallel to to The Strip on its East. Turnberry Towers are comprised of Turnberry Towers West ( 222 Karen) & Turnberry Towers East ( 322 Karen). Each Tower is 45 stories. The floor plates are identical in each high rise tower and the floorplans repeat themselves on each floor, so each “stack” goes all the way up the building. The penthouses have extra high ceilings. What are the HOA Dues at Turnberry Towers & What do They Cover? There are Two Homeowners associations at Turnberry Towers: The Turnberry Towers Master HOA and the HOA for the East or West Tower. Aside from the lovely resort Style 9+ acre grounds which includes tennis courts, the HOA dues at Turnberry Towers cover parking garage maintenance ( each unit gets the use of 1 spot and 1 storage unit) , The Guard and Security, insurance on the structure, one of the most helpful and gracious concierge & HOA staffs in the city, water, sewer, trash, gym, pool, recreation room, basic COX cable TV and web access. If you are looking for full time Limo Service, you will want to have a look at the luxury condos and penthouses for sale in Turnberry Place and Panorama Towers. The Martin has Driver Service on Thursdays-Saturdays. Dues are approximately $ 550 for the 1 bedroom and $830 to $950 for the 2 & 3 bedroom units. What Are the Rental Restrictions at Turnberry Towers? Rentals are limited to 6 months minimum. All leases are subject HOA Board review. The HOA requires credit and background checks be paid for by the tenant applicants. Tenants may have pets, but the pets deposit is significant and only partially refundable. The HOA also takes 1 months rent from the tenant as an HOA security deposit that is refundable upon tenant move out of there is no damage to any of the common areas. Turnberry Towers and Turnberry Place distinguish themselves from many other high rise condos in Las Vegas because of their use of deep, spacious balconies. In Turnberry Towers, The One Bedroom Condos, and the larger 04, and 05 Stack floorplans have balconies facing South. The 2 & 3 bedroom floorplans have bi-directional balconies. These photos below were taken from an 8th floor unit. In Turnberry Towers you don’t need to be on a high floor to enjoy beautiful views. If you would like us to send you the floorplans for Turnberry Towers, please reach out to us. The Stirling Club is Opening in spring of this year (2019) which will be right across the street. This will be an enormous perk and amenity to Turnberry Towers Residents. Discounted membership rates will be given to Turnberry Place Owners, and I expect the same may apply to those who live at Turnberry Towers. Thinking of Selling Your Turnberry Towers High Rise Condo? Our Team has a VERY strong track record of Selling Turnberry Towers. Have a look at some of our previously sold condos at Turnberry Towers by Clicking on The Virtual Tour links below. We direct all photo shoots. Our Virtual Tours are syndicated widely across the web, and include LUXURY sites such at The Dupont Registry. ENJOY! We are fortunate to represent Sellers who have some of the most exquisite luxury high rise condos in our amazing city.